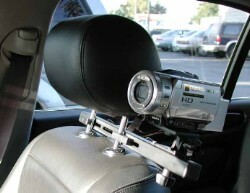 The CruiseCam video camera mount clamps inside the vehicle, to the passenger seat headrest, allowing hands-free filming from the driver's viewpoint. 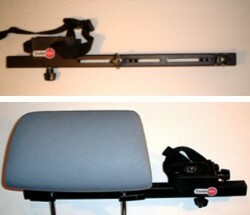 Lightweight and portable, the Headrest mount installs easily in minutes without the use of tools. Your recorded video will have the same look as experienced by the driver's vision, due to the mount's stiffness and clamping system which effectively joins the mount to the seating system. Together, they act as unified mass and share the vehicle's harmonic frequency. 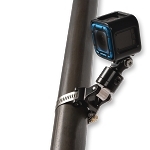 This mount provides an easy method to mount any camcorder to your *vehicle! Works with the universal mounts and the ConeCam camera also. *Requirements- The CruiseCam Headrest Mount will easily clamp to any vehicle that uses headrests that mount on posts and raise up a minimum 1" to provide clearance for the mount frame. The area to the sides of the headrest posts must be clear. If you can place a straight 15" long stick against your headrest posts, the CruiseCam Mount will work fine.